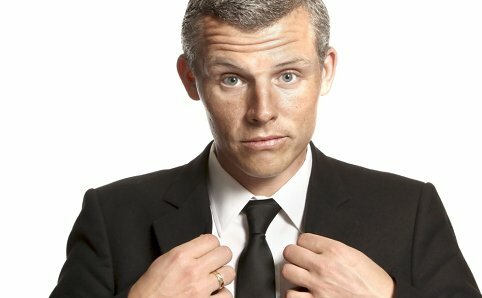 Des Bishop returned to Vicar Street – his home away from home, away from home –with his new show “Des Bishop Likes to Bang” this month, and banging it certainly was. Anyone who has seen any of Bishop’s previous shows will be aware that clues to their content lie in their titles, and “Des Bishop Likes to Bang” proved to be no exception. Female fans will be sad to learn that this particular title actually refers to the Irish-American comedian’s attempts to learn the drums. It is hard to imagine how a comedy show based around one man’s bid to master percussion instruments could be entertaining, but it was. Extremely. The show began with a low-lit stage hosting an electric drum kit, which was dwarfed by a harp. Des – or Dessie, as he is known to the masses in Australia – began the first half of the show with some loose improv that was inspired mainly by those who were unfortunately situated in the first two rows. The harp was brought into play when his support act took the stage for a brief period – before Des returned to bang out the comedy – literally. The second half of the show centered on the comedian’s two biggest talents – comedy and music, or rapping to be more precise. Bishop tackled the big issues plaguing Ireland today: emigration; alcohol abuse; wheat versus non-wheat diets and the stress a man in his mid-thirties faces when trying to purchase ‘just for men’. Mixed in with all this was some hip-hop or ‘hip-harp’ as it was branded. The show came to a banging conclusion when Des and co. preformed a ‘hip-harp’ song that relates to stalking your ex-girlfriend via her Facebook page. It is astonishing how much comedic value the funny man was able to get out of a simple everyday instrument – and truly a testament to his talents and rapier wit.